The Schwinn AD2 Airdyne Exercise Bike is the most affordable fan bike the famous bike manufacturer offers. This smaller, more affordable version offers plenty of perks, but I have to be honest- it’s not going to work for everyone. I’m a big fan of the Schwinn brand because they do offer awesome fitness equipment, and have done so for a long time. There is no bigger name in the bicycle world. But not everything they produce is perfect. I hope this review helps you decide whether or not you should consider investing in the Schwinn AD2. There are tons of exercise bikes on the market in every price range. This means you should be able to find the right fit for you sooner or later. Just means doing your homework (which if you are reading this article, then you must be!). Let’s get started with a quick word on airdyne bikes. “Airdyne” is what Schwinn calls their fan bikes. Fan bikes, also known as air bikes, are a type of upright exercise bike that uses spinning fans to deliver the resistance. 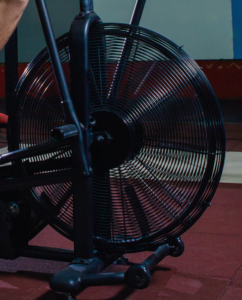 This type of exercise bike has a few unique characteristics that make it a little different than spin, recumbent, and traditional upright bikes. First of all, fan bikes don’t have a traditional resistance system. Most exercise bikes we are used to have an adjustable magnetic resistance system. That is, we adjust the intensity we want during our workout by pushing up or down on the resistance button- when we do this, the resistance goes up or down by using magnets and a spinning metal disk. In a fan bike, fans are used to create the resistance (big surprise right?). The fans are attached to the flywheel. As the wheel spins, the fans create drag, – the faster you pedal, the more drag you create and the harder it gets to pedal (the resistance increases). The benefit of this air resistance is that it is unlimited. The harder you pedal, the more resistance you feel. This is why airdyne or any other fan bike is so good for high intensity exercise. They are perfect for HIIT workouts and are often used by Crossfit athletes. The second big difference is that fan bikes have handles you can use to push with your arms too. Most exercise bikes do not. Some recumbent style bikes have handles (NuStep comes to mind). This is great because it gets more of your body involved, really turning your workout into a full body routine. More body parts working at the same time means more calories burned- which is usually one of the primary goals when exercising. So, in conclusion: airdyne bikes are Schwinns versions of fan bikes. They are great for intense workouts and burning a ton of calories. Now that we’re all on the same page regarding airdyne bikes, I want to discuss the AD2 more specifically. I mentioned in the intro that there are some definite pros and cons regarding this bike. My job here is to present my opinions on what this bike has to offer- it’s ultimately up to you to decide whether or not the AD2 makes sense for your needs. I mentioned above that the AD2 is a fan bike and uses fans cutting through the air to create your resistance. This being the case, the resistance the AD2 can provide is unlimited. Well, it is limited by one thing: how hard you can pedal. Users mostly agree that the operation of the AD2 works fairly well. It has a single belt that is connected to the foot pedals and handlebars. This means that the pedals and handlebars operate together at the same time and this can’t be changed. It might take a little getting used to if you have never used a fan bike before, but it shouldn’t be a big deal. In case you did want to work just your legs, you can let go of the handlebars. Just be aware that the handlebars will continue moving- you don’t want to get whacked by one of them if you lean forward! If you want to isolate your upper body, there are stationary foot rests you can place your feet on and just operate the handlebars. Again, just know that the foot pedals will continue rotating- be careful if you are putting your feet back on them to continue your workout. Another little perk about fan bikes that I forgot to mention earlier: you will get a little cool air from the turning fans. Schwinn actually designed the AD2 to limit the air being pushed back at you, but you will still get some fresh air from it. Personally, I like the air flow, it makes me feel like I’m really working. Ok, so the seat is the biggest problem most users have with the Schwinn AD2. Long story short: it’s uncomfortable. To defend Schwinn, this is a common problem with most upright exercise bikes. The unfortunate truth is that bike seats are uncomfortable. In order for them to be functional they have to be pretty small. Sitting on a small surface over time becomes uncomfortable. I love my Diamondback 510Ic, but it’s kind of a pain to sit on. I ended up having to order a gel seat cushion. They are pretty cheap and do help. Click here if you want to see the one I bought. But besides the comfort factor, Schwinn could’ve included a better seat on the AD2. The included seat is height adjustable, but you can’t adjust front to back (fore and aft). This makes getting a perfect fit more difficult. 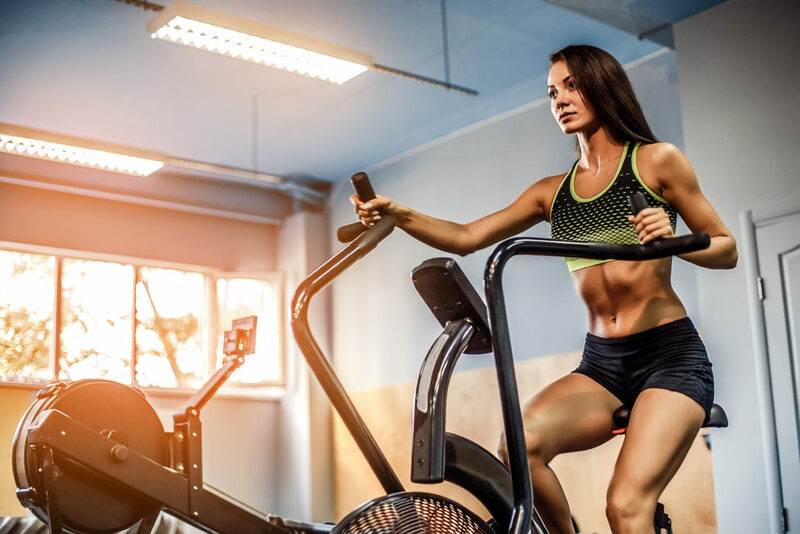 A lot of upright exercise bikes, especially spin bikes, give you the ability to take off the included seat and replace with another traditional bike seat of your choice. Schwinn doesn’t give you the option to do this. You are stuck with the uncomfortable seat they included. Although according to some users, you can buy an adaptor kit from Amazon that makes switching seats possible. The AD2 comes with a small LCD screen that will display time, speed, RPM, distance, and calories. Nothing fancy here. Should get the job done if you aren’t looking for a bunch of fancy features like bluetooth connectivity. It would be nice if it had telemetry heart rate monitoring, but this is a budget fan bike after all. FYI, the console is powered by 2 AA batteries, so no need for an outlet for an AC adaptor. It may be a hassle when you have to replace batteries, but at least you can place this bike anywhere in your home without having to have access to electricity. Users almost unanimously agree that assembling the AD2 is a piece of cake. There aren’t many parts to put together and it should be fairly easy for anyone to assemble by themselves. A definite perk because some exercise bikes can be a real hassle. There are a total of 8 screws that need to be installed and the AD2 is ready to roll. You are basically just attaching the pedals and arm handles. Even folks that gave this bike a negative review tended to agree that assembly was easy. So if you are looking for an exercise bike that easy to assemble, the AD2 would fit that category. I always look to weight capacity when researching fitness equipment. It’s actually one of the first things I look at. The Schwinn AD2 has a 250 lb weight limit. This is on the low end for home fitness equipment. I recommend most users to aim for a 300 lb weight capacity when comparing machines because it signifies increased product durability. Machines with higher weight limits usually feel more stable during use too. That said, budget fitness equipment tends to have lower weight capacities than higher-end options. The fact is, there are reasons why budget equipment costs less. Being made out of less sturdy parts is one reason. I would say the AD2 is priced on the high end of the budget scale, but I still consider this to be a budget fan bike. As a budget bike, the 250 lb weight capacity isn’t abnormal, but it’s definitely more suited for smaller users. This is actually a pretty respectable warranty for a budget exercise bike. There isn’t a ton of competition for air bikes in this price range (there is more competition in the lower and higher price ranges), but when I compared this warranty to other similarly priced bikes, Schwinn came out on top. For comparisons sake, there is a Marcy fan bike that costs about $100 less and comes with a limited 2-year warranty. Sunny Health & Fitness has a fan bike that costs about $100 more and only comes with a 3 year warranty on their frame and 90 days on everything else. Schwinn doubles their warranty if you upgrade to the AD6 or AD7, by the way. Overall, when it comes to warranties, Schwinn is pretty generous. Overall, the Schwinn AD2 Airdyne Exercise Bike is a pretty good air bike for the price. There are definitely some areas where Schwinn could make some improvements, most notably the seat. The seat on this bike is uncomfortable and lacks the customization that other similarly priced air bikes offer (fore and aft adjustments). The Sunny Health and Fitness bike mentioned earlier, for example, does offer the more advanced seat adjustments. I don’t think for a second that Schwinn is unaware or disheartened by user complaints regarding the seat on the AD2. After all, they upgraded the seat on the AD7 (as well as several other key features), but it comes with a significantly higher price tag. I have to give it to Schwinn for offering the great warranty on this bike though. It’s the best fan bike warranty I could find in this price range, hands down. When it comes down to it, would I ultimately recommend the Schwinn AD2 Airdyne bike? Yes…if your budget is strictly limited to $400. It does have a great warranty and is coming from a reputable brand. There have been some complaints about quality control however. But as long as you receive everything in working order, I think you will be satisfied with the AD2 for the price. If you have a little wiggle room in your budget, you may want to consider the Sunny Health and Fitness Tornado Air Bike with it’s better seat and significantly higher weight capacity.